At Faris we have been dressing the modest man for several years, sourcing the right fabrics and focusing on every step of our carefully curated production process, to create the perfectly fitted thobes. A beautiful crafted Jubba takes time and expertise, both of which are used in abundance to ensure each piece is as high in quality as the next. Here, we take a look at our production process to show you how every piece from the Faris collection is created. Concept – We take our time to design pieces that we know our passionate clients are going to love wearing. Each piece draws from both classic references and modern styling to create thobes for men and boys that are guaranteed to fit perfectly and make you feel amazing. Pattern Making & Cutting – Once our designs have been finalised, pattern making and cutting commences. 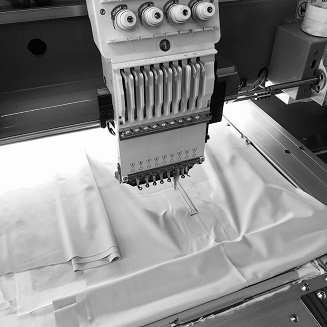 This is where we include a soft upper body canvas for a more luxurious feel, giving every thobe structure, creating the perfect fit on each and every size we offer. Stitching – One stitch at a time, our thobes come together. From the initial stitching of the main seams to the sleeve and placket embroidery that is key to each piece, care and attention is paid to every aspect of the Jubba to ensure the highest possible quality. Trims – Our trims are important to us and we complete each of our men’s Jubbas with our signature styling. From the handmade thread buttons to the carefully made classic tassels that complete the look, every detail is essential. As a Faris client, you’ll benefit from the knowledge of a well experienced team, piecing all of these aspects together to ensure we keep our promise to you, bringing you thobes designed with care, attention and a whole lot of style.